July 20, 2017 — A 3rd year, part-time student at the University of Houston Law Center and a veteran of nine years in the oil and gas field has been awarded two scholarships by the Rocky Mountain Mineral Law Foundation. "I competed with a large number of well-qualified applicants and to be selected amongst my peers is truly an honor," said Calvin F. McKnight. "The RMMLF has been dedicated to the study of laws and regulations relating to natural resource and energy law in which I have had great interest since before my legal studies began." McKnight received a $7,000 RMMLF scholarship in addition to a $7,000 Joe Rudd Scholarship, named in honor of a prominent natural resources attorney. The scholarships are designed to encourage the study of natural resources law by highly-qualified students who have the potential to make a significant contribution in the field. "My journey in energy started after my sophomore year of undergrad when I received my first internship with BP as a production engineer," said the 32-year-old Louisiana native. "It was there I realized how fascinating and vast the energy industry is." After graduating from LSU with a B.S. in engineering, he worked for five years in various roles for Center Point Energy, including as a field engineer, lead design engineer, and lead technical engineer. Four years ago he joined Kinder Morgan, Inc., as a project manager in the field of natural gas transmission pipelines. "This summer I am working as a law clerk for the Kinder Morgan transactional legal group," he said. "It is my goal to continue to gain as much experience and knowledge while in law school to begin my practice as an attorney specializing in energy transactional work." "Calvin is a shining example of the University of Houston law student," said Dean Leonard M. Baynes. "He is super smart and talented. Most importantly, he has grit providing him with the capacity to juggle a wife, young family, demanding job, and challenging school work. 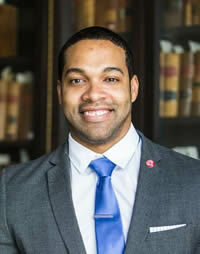 Calvin is just one example of the Law Center's amazing students. And the law students today share the same spark as the countless number of Law Center graduates who preceded them." While in law school, McKnight has served as vice-president of the UHLC chapter of the Association for International Petroleum Negotiators (AIPN), and mentored 8th grade students at the Lawson Academy as well as the Law Center's Pre-Law Pipeline Program. McKnight shares credit for his success in a demanding lifestyle: "I thank my wife, Sabrina, and my two children, Julianna, 2 years old, and Parker, 8 months; without their support none of this is possible."